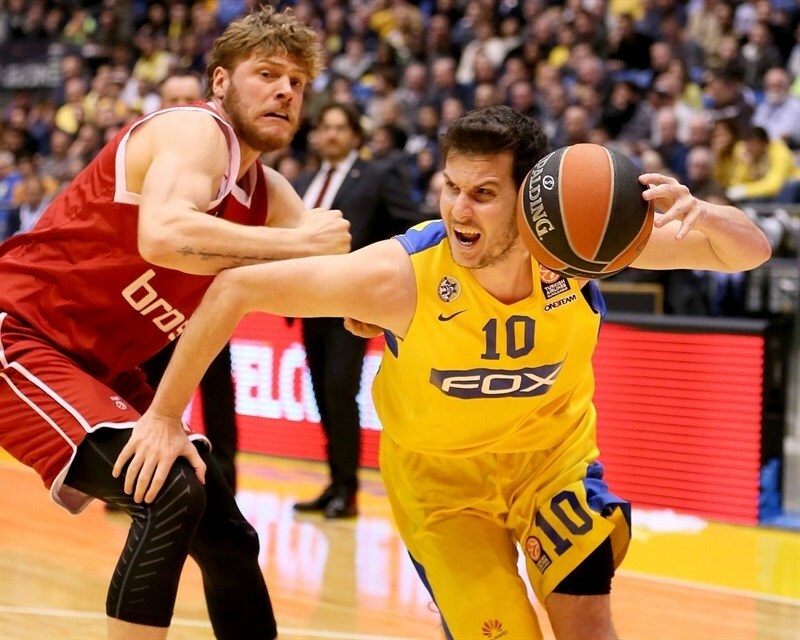 Maccabi FOX Tel Aviv tied a team record with 16 three-pointers in routing Brose Baskets Bamberg 85-65 Thursday night at Menorah Mivtachim Arena. 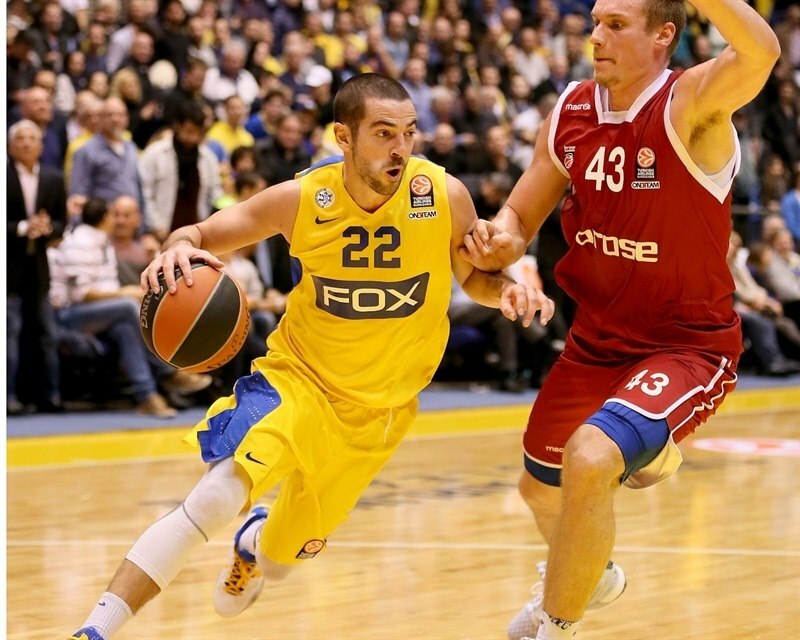 The win kept Maccabi alive in the race to the Top 16 with a 3-6 record, though there is no margin for error. For the 2014 Euroleague champs to advance, they need CSKA Moscow to beat Darussafaka Dogus Istanbul on Friday night and to them beat that same team in Turkey by at least 11 next week. 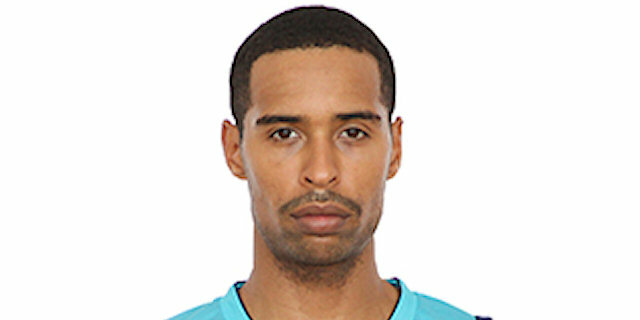 Bamberg, which is already assured a Top 16 berth, fell to 5-4 in Group D. Sylven Landesberg made three straight threes in the first quarter – though the official scorer later changed one of them to a two-pointer – as Maccabi pulled away early and never looked back. He finished with 19 points on 5-of-7 three-point shooting for the winners, while Taylor Rochestie tallied 16 points and 7 assists, Devin Smith scored 12, Trevor Mbakwe posted 11 points and 9 rebounds and Guy Pnini did not miss a shot in collecting 11 points. Daniel Theis led Bamberg with 13 points and Darius Miller added 11. Rochestie opened the scoring with a floater and Arinze Onuaku’s baby hook made it 4-0. More than two minutes passed before Nikos Zisis darted through the Maccabi defense for a layup and Bamberg’s first points. 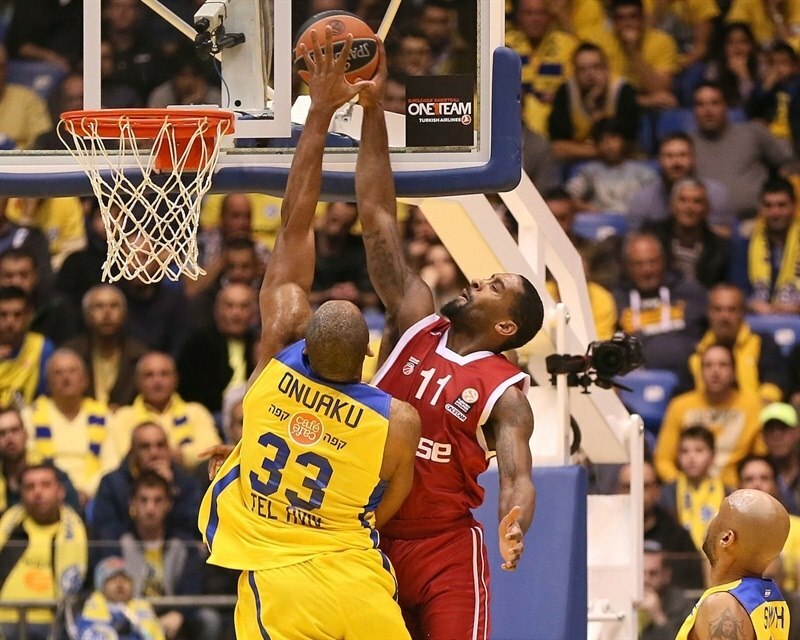 Onuaku added to the Maccabi lead, but Brad Wanamaker drove for a one-handed dunk on Onuaku. Landesberg’s first three made it 9-4 midway through the opening quarter. Landesberg remained red hot with two more threes, which prompted a Bamberg timeout at 15-4. Daniel Theis revived Bamberg with a jumper and Leon Radosevic added a pair of free throws. After Mbakwe’s dunk, Landesberg took a seat with 2 fouls. Dragan Bender restored a double-digit advantage with a three and Rochestie made it 15. Janis Strelnieks steal and layup ended the quarter with the visitors trailing 23-10. The momentum remained with the hosts as Mbakwe easily rejected Yassin Idbihi before Guy Pnini added a three from the corner. Mbakwe made it an 18-point game. Wanamaker missed twice from the line and Mbakwe rejected Miller to keep the hosts cruising. Elias Harris hit a jumper, but Mbakwe responded with a basket inside. 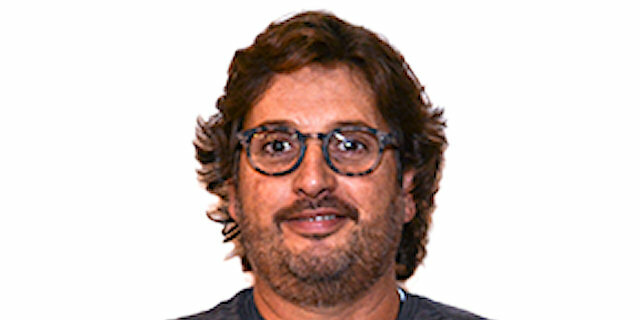 Bamberg adjusted as Miller hit a three from the top of the key and Wanamaker stripped Yogev Ohayon and dribbled in for an easy layup. 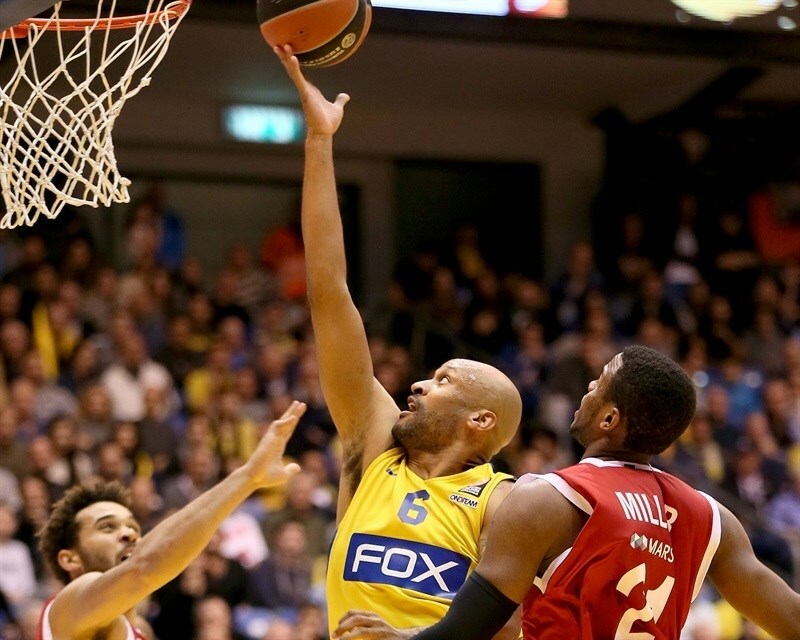 Harris drew the visitors within 30-19 before Maccabi took a timeout. 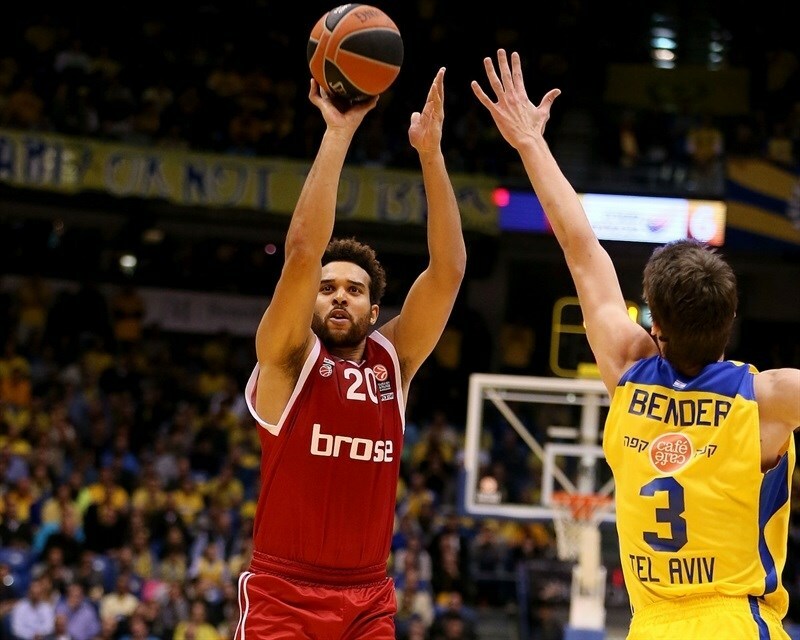 Rochestie ended Maccabi’s slide with free throws. Miller finished a three-chance Bamberg offense with a layup, which Rochestie matched with free throws. Radosevic scored on the pick-and-roll and Miller hit a jumper to make it 34-25. Devin Smith connected twice from downtown to restore a comfortable lead, 40-25. Theis made 3 free throws over the next two possessions. Onuaku muscled in his own miss and then rejected Patrick Heckmann to keep the hosts up 42-28 at halftime. 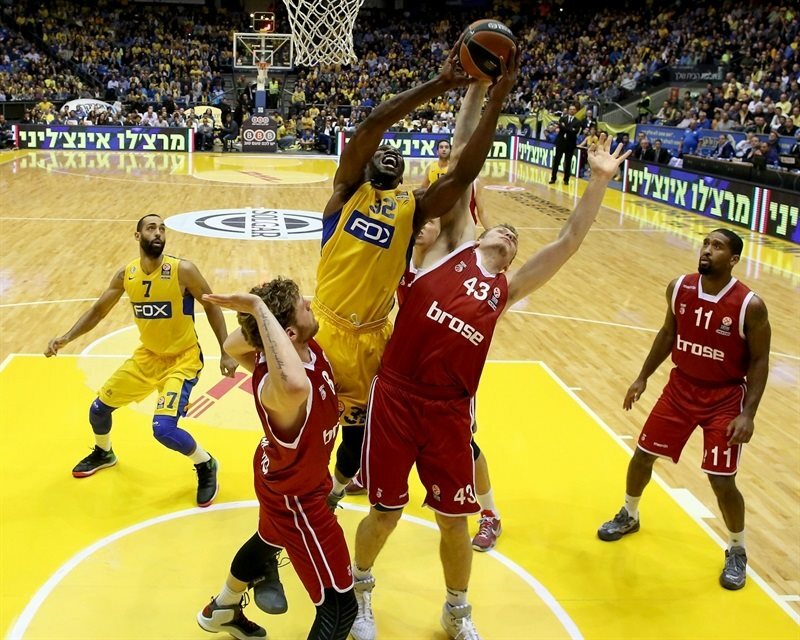 Onuaku rejected Theis inside and Landesberg scored at the other end as Maccabi came out in style. Smith added a three to match the biggest lead from the first half at 18. Theis got Bamberg going with free throws. 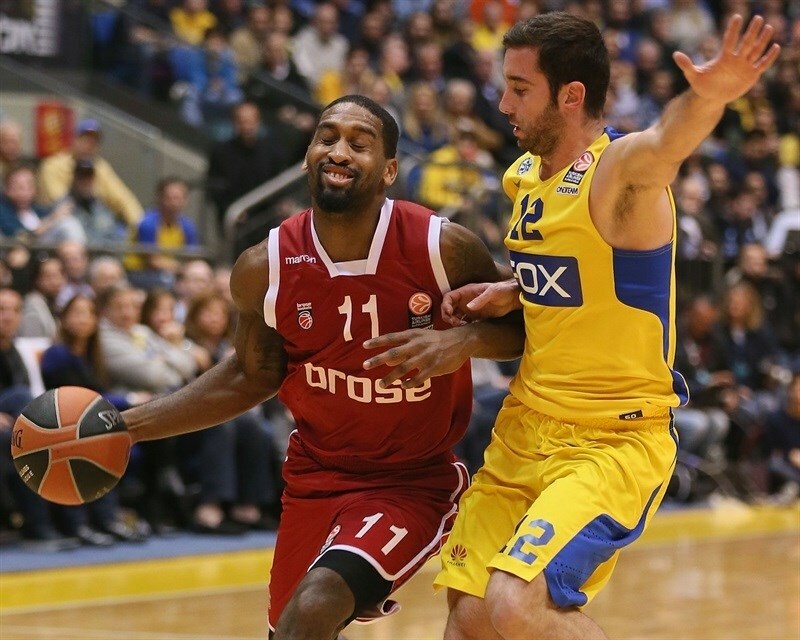 Brian Randle became the sixth Maccabi player with a three-pointer when he made it 49-30. Strelnieks countered with a long jumper. Landesberg hit again from downtown to push the Maccabi lead into the 20s. Miller and Wanamaker scored for Bamberg, but back-to-back triples from Pnini and Landesberg made it 59-36. Wanamaker and Pnini traded free throws before Radosevic scored in the paint. Nicolo Melli finally got on the scoreboard with 2 free throws only to see Landesberg connect again from behind the arc. Lucca Staiger and Strelnieks hit threes for Bamberg, but Pnini banked in a triple and Ohayon beat the third quarter buzzer with a three to make it 70-50. Ohayon split free throws two minutes into the quarter. Pnini was called for an unsportsmanlike foul, which led to a pair of Harris free throws. Bender rejected Theis at the rim. Aleksej Nikolic nailed a three for the visitors. Mbakwe scored inside for the hosts. Miller sank free throws and Mbakwe a jumper. 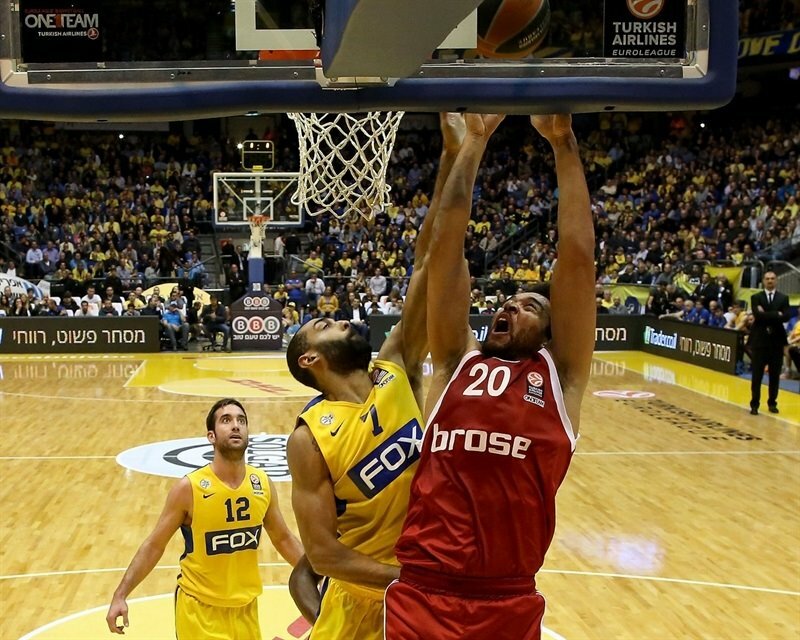 Smith attacked the basket for a three-point play and after Theis scored inside, Rochestie drilled Maccabi’s 16th three. The game was clearly decided by that points as the Maccabi fans serenaded their heroes in the closing minutes. "I was really happy with the effort in the first half, we played really great basketball and competed well, and we kept them to a low score. In the second half, we relaxed when we got to a 20-point lead, the players were beginning to improvise and I didn't like that. I'm very proud that we kept them to 28 points in the first half." 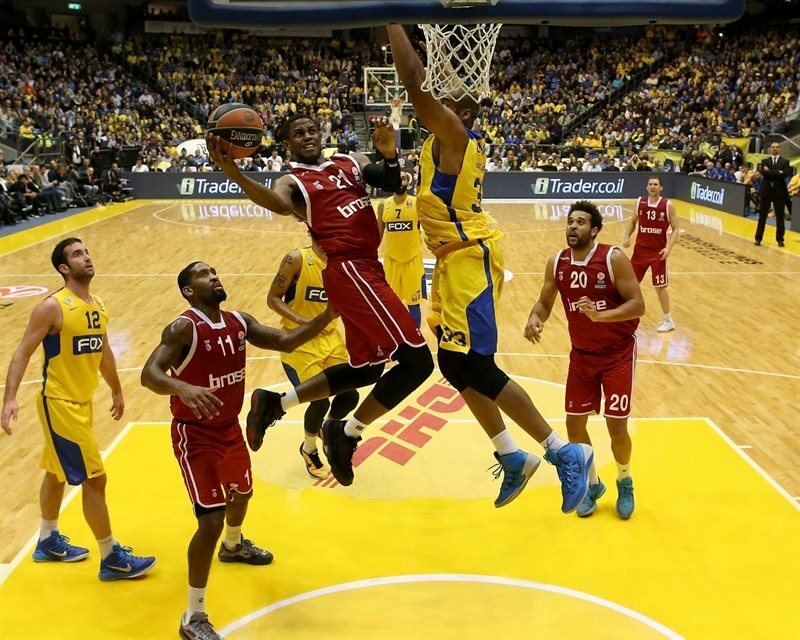 "Congratulations to Maccabi on a very well-deserved win. They played with energy and great three-point shooting. We were not ready to compete and I did a terrible job preparing them for playing in this arena. We had a very poor night. They forced us to have a bad day. We were not ready for this impact, we were terrible on defense and slow on offense. 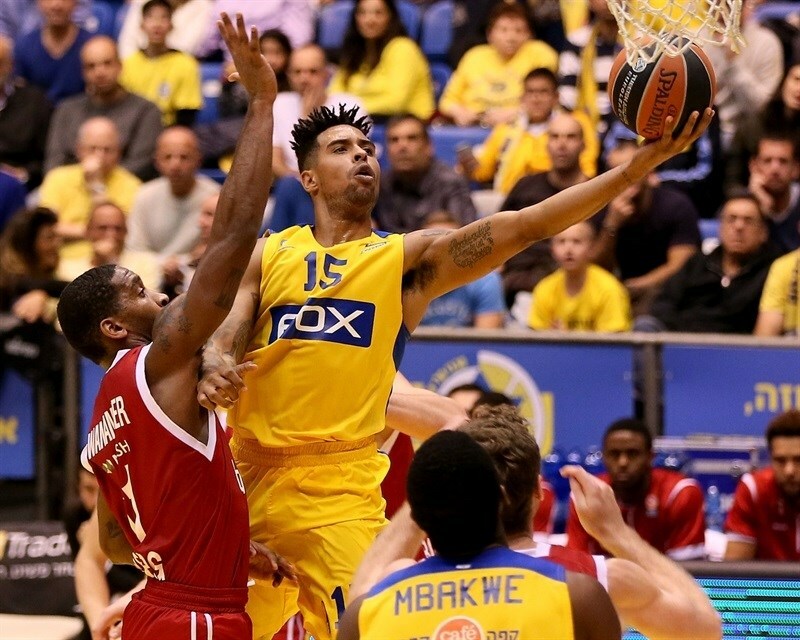 I hope Maccabi will save some three pointers for the next game, because they will need it." "I was just feeling it tonight. My teammates, they saw it and when I was in the game they found a way of getting me the ball. That helped with my confidence and kept it going. Tonight was a great team win, because we held a great team to 65 points. We really needed this one. [About Top 16 chances:] Playing on this club, I’ve seen a lot of crazy things, so I’m not gonna count anything out. We’re going to come to the game, play hard, play our game, hopefully play the way we’ve played the last couple of games and get our result. "